Shopping for Horror: Halloween Busts? Everyone deserves a good scare! What lies behind Michael Myers' eyes? From the Halloween movie franchise. Statue features a pulsating light-up pumpkin base! Everyone deserves a good scare, and Michael Myers is just the one to give it to you! 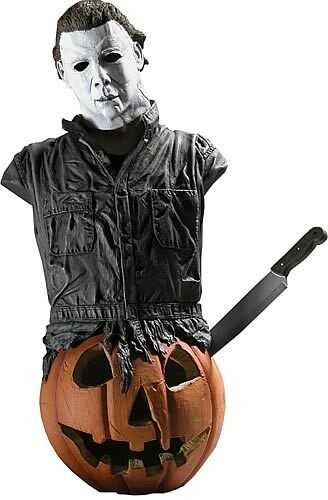 From the Halloween movie franchise, this creepy Michael Myers Mini Bust stands nearly 9-inches tall and features a pulsating light-up pumpkin base. Battery included. On Halloween night in 1963, six-year-old Michael Myers unexpectedly murdered his 17-year-old sister, Judith. As a minor, Michael was sentenced to Smith's Grove Sanitarium, where he remained locked away for 15 years. On Halloween night in 1978, Michael Myers escaped the sanitarium and returned home to Haddonfield to resume his murderous rampage. What's lying behind Michael Myers' eyes is "purely and simply... evil."